I have always loved the close-up photos of water droplets, either from a splash or a drip. So when I finally decided that I wanted to try taking a photo of a droplet, I set to work in my backyard. And to be honest, I had to do a little jimmy-rigging to create the set up of water dripping off an icicle. Let me explain. I found an icicle hanging from my roof and broke it off. Using rubber bands and some clips, I hooked it in a tree that was eye level to me and the upper heights of my tripod. Since it was still a rather cold day, it was obvious that the icicle wasn’t going to drip by itself, so I had to help it along. No, that didn’t mean bringing out a blow torch or blow dryer to melt it. Instead, I took a syringe used for taking medications orally and filled it with water. I then squeezed the syringe, squirting water onto the upper heights of the icicle and letting the water run down it and off the tip. I then snapped countless shots, hoping to get one that looked just right. I didn’t want the trees in the background to distract from the droplet or icicle, so I went to AV priority and opened the aperture as large as I could without washing out the subject. Although I don’t recall the shutter speed or ISO on my Canon Digital Rebel XT, I am confident in saying that I went with a higher (more sensitive) ISO and a fast shutter speed to stop the drop in motion. 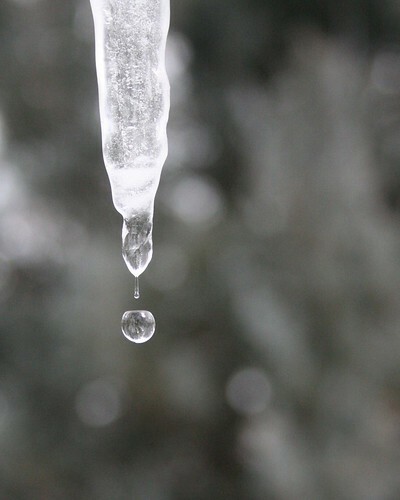 I ended up with a couple of nice photos of this same icicle, but with different variations of the drip; however, I’ll have to share those another time… that is if people are still interested after I revealed my secret to setting the stage for these photos! Next Post Hungry for cookies? You’re welcome. There are other photos I have seen that have an image in the droplet (magnified from something behind the droplet) that would be cool to do, but I don’t think I have the right type of Macro lens to be able to do it right. If I ever get a good photo of that, I’ll be sure to share it. Thanks. I love your dedication. So much work for a little drip! It was well worth it. This picture is fantastic.